These are both natural ingredients that work together to erase wrinkles and fine lines at the cellular level - below the surface of the skin - which is why they're so effective. Vitamin C is the key to maintaining healthy, youthful skin. It's a powerful antioxidant that slows the rate of free-radical damage, which causes skin's dryness, fine lines, and wrinkles. It helps combat and even reverse time's effect on your skin, because it produces collagen - a protein which makes skin appear plump and firm. Applying Vitamin C to the skin topically is up to 20 times more effective than taking it orally. Dr. Oz calls Vitamin C "the secret to cheat your age". 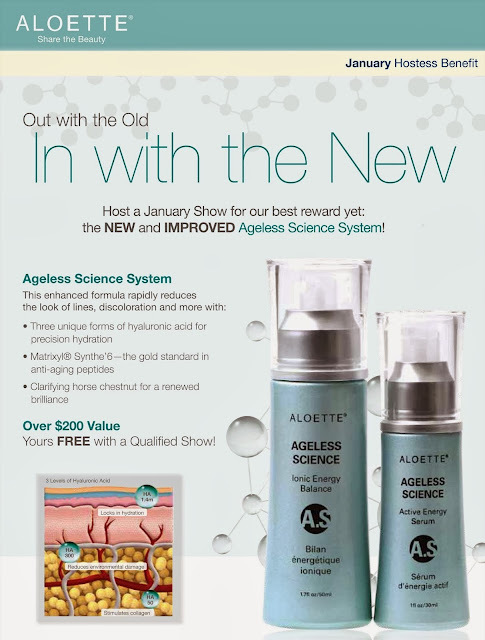 Aloette's AGELESS SCIENCE is pure hyaluronic acid, and is for FREE for hosting a show with me in January! a $250 value!~ We also have pure vitamin C powder -Dual Action Bio C Super sale for $19.95! Description: Vitamin C is the most effective antioxidant known to help prevent free radical damage, reduce the appearance of fine lines and wrinkles and aid in stabilizing collagen levels. 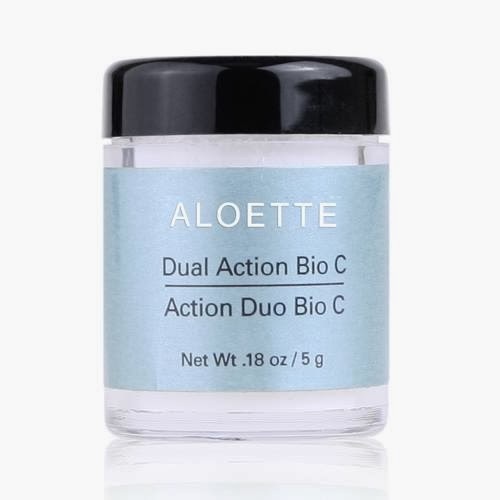 Utilizing nano-sized pure L-ascorbic acid (vitamin C) with an advanced time-release delivery system, Dual Action Bio C mixes with any Aloette serum for enhanced age defiance. Providing a steady six hour release upon application, this antioxidant mixing powder extends the age-defying benefits of your favorite Aloette treatments.